On Wednesday, December 5, 2018, the Homeland Security Program at Eastern Kentucky University’s College of Justice and Safety held it’s 5TH Annual Undergraduate Research Showcase. The showcase, consisting of both juried poster and oral presentations, provides an avenue for undergraduate students to demonstrate their work and experience communicating their research with others. Students presented research posters as well as oral presentations to showcase the hardwork they have put in over the semester. Students competed against one another for a first place plaque and scholarship funds in each category provided by funds from the Bluegrass State Intelligence Community Center of Academic Excellence. 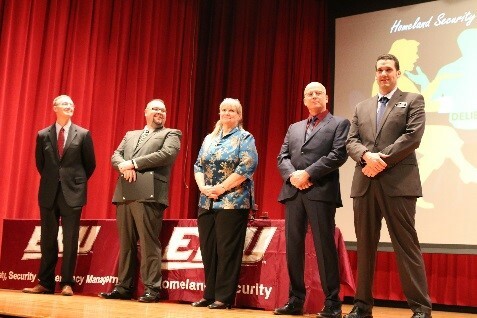 The winner of the oral presentation was Mr. Shaker S. Ezaizat, a senior Homeland Security major from Garrard, Kentucky. Shaker’s presentation was entitled, “The Use of Social Media during Disasters: Shifting Paradigms for Disaster Planning and Response”, based on his research from the HLS 441 course, “Homeland Security Technology”. The winner of this year’s HLS Undergraduate Research Showcase Juried Research Poster Presentation (as well as the intelligence studies category) was Mr. Jonathan Herald. Jonathan’s poster was entitled, “Why is Social Media Effective for the Terrorist Recruitment of Individuals in the U.S.?” based on his research from the HLS 321W course, “Critical Problem Analysis”. This research showcase as well as others hosted within Eastern Kentucky University are not only an amazing opportunity for OUR students, but also a great way for others to learn of the wonderful innovative minds that this university helps mold. We hope all students take advantage of what EKU can offer and share their wonderful minds and ideas with the world!